Ross Matthews (No.12) holds his head after being struck by a coin. Raith Rovers have launched an investigation after a player was struck on the head by a coin thrown from the crowd. 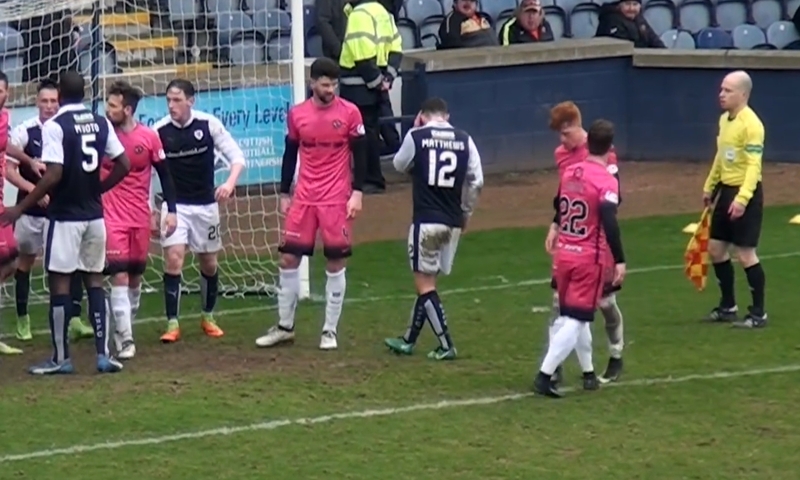 Midfielder Ross Matthews was seen clutching the side of his head after the shocking incident during Saturday’s match against Dundee United at Stark’s Park. The Kirkcaldy club said the 21-year-old sustained a minor injury but claimed the encounter could easily have had “disastrous consequences”. Chief executive Eric Drysdale said the coin, which appeared to have been thrown by a fan in the United end of the stadium, had hit Matthews just above the ear. “As luck would have it it didn’t make contact with the eye,” he said. Mr Drysdale and other club directors are reviewing CCTV footage of the clash as well as video taken by Raith TV in an effort to identify the the person responsible. 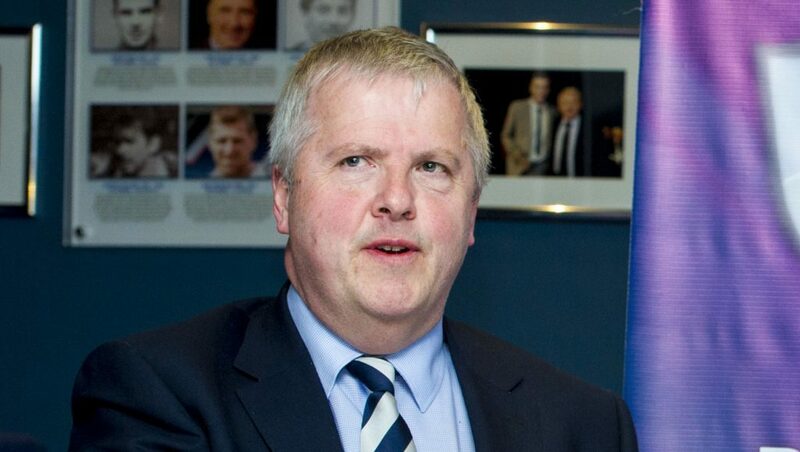 The police and the Scottish Football Association will be informed if an identification is made. “We are obviously looking at this to try to find out who may have done it and if we can identify somebody we will take it further,” Mr Drysdale said. The incident happened towards the end of the crunch match, which Raith won 2-1 – making it the fifth consecutive game without a win for United. Matthews can be seen running into a congested penalty box following a melee in which four players were booked. A missile is then seen soaring through the air and hitting him above his left ear. The player staggered and almost sank to his knees but was able to finish the match, despite a large bump on his head. Mr Drysdale added: “I don’t recall a similar incident at Stark’s Park in my time. A spokesman for Dundee United said the club had been informed of the incident and were awaiting further information. Police Scotland said they had not been contacted regarding the matter. Raith fans reacted furiously after the match. 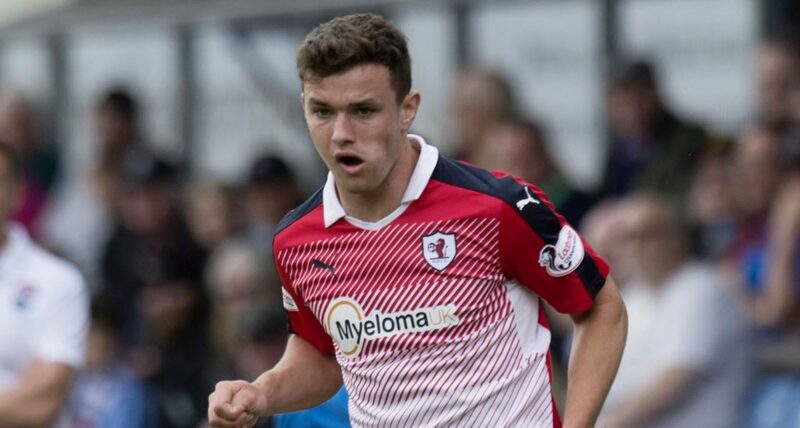 Taking to Fantalk, an unofficial online forum for Raith Rovers fans, one supporter described the incident as “very nasty” and another said: “I hope this scumbag is identified and dealt with accordingly”.